I mentioned this one a few weeks ago. Today I got a good photo of it. Windgap Avenue, bridge over Chartiers Creek and railroad tracks. Just like that one on the 40th Street Bridge, there are scuppers all over the place with diagonal slots, and then just this one, wide enough to eat some MTB tires. My trip to Crafton also included a trip from Crafton, accomplished by pushing the bike up the outbound/westbound sidewalk along Steuben Street. I don’t know exactly where the border is between the City and Crafton, but there are six drain grates between the Middletown Road split and Union Ave. Here are four of them. 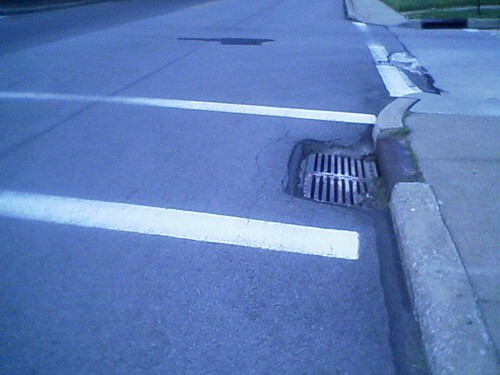 The problem is less the longitudinal slots and more the four-inch drop into the drain. The fact that most are on the inside of a curve headed down a steep hill serves to hide them. All of these clearly have “Allegheny County” stamped on them. #6 of 6, at Union Avenue. i went to oakland on my lunch break, and pulling onto sennott street from bouquet, there’s a big manhole cover (that i’m nearly certain was solid yesterday) that is now slatted nearly parallel to the road. i’m pretty sure this is new, and in an area where i see bikes every time i happen through, it seems pretty boneheaded to have done this. i didn’t stop for a picture, though. Here’s a new one, and on a main drag: East North Ave, eastbound, opp Sandusky, in the shadow of Allegheny General Hospital. The photo is looking westbound. That slot is exactly where a bicycle tire would be. 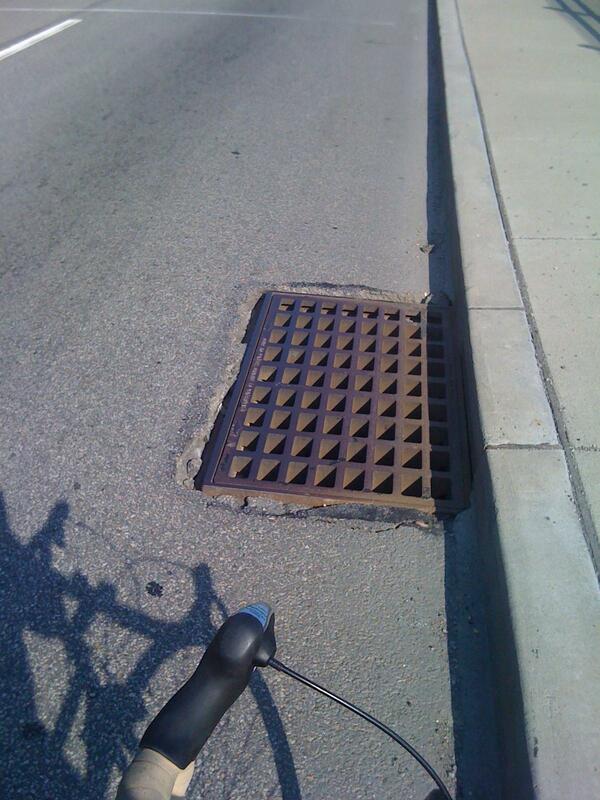 The grate itself is fine, except for its shifting sideways an inch and a half, wide enough to eat any road tire. Not one of your higher traffic streets, but still, it’s aligned with the curve in the street and has full slots. North Point Drive, under the West End Bridge, next to the Cardello Building and near the Casino. Again, this one is more a problem for baby buggies and wheelchairs than bicycles, but the potential for cyclist trouble is undeniable. In fairness, the wheelchair ramp does not line up with the grate, but if someone went off the edge of the curb instead of using the ramp, they’d hit this straight on. Think 7-year-olds on 16″-wheeled bikes rolling alongside a parent who’s more minding the 4yo having a tantrum. Apparently a motorcyclist hit a grate on Western Ave in Chartiers at night and died as a result of the crash. Died as a result of “was not wearing a helmet”. There are plenty of helmet threads if you want to dig one of them up… but it’s not terribly relevant to this discussion. 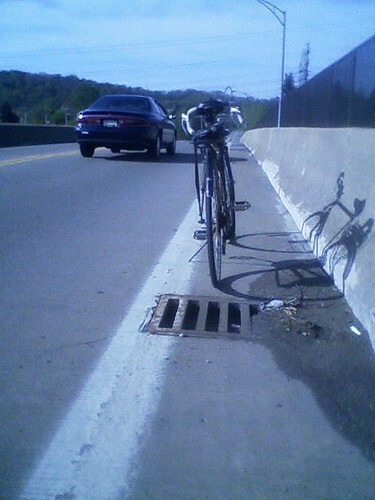 “ran over a Western Avenue culvert” on a motorcycle isn’t exactly a longitudinal drain grate issue for cyclists. I’m missing the relevance to this discussion. I’d like to see a photo of the exact thing this guy hit. True, what matters to motorcyclists may not also be a problem for bicyclists, but there’s that grey area for someone buzzing around on a 50cc scooter for which some of these might just be a problem, too. Also, FWIW, of the various items I’ve reported over the almost three years of this thread, I really haven’t seen much progress. We’re halfway through the construction season, and I can’t think of a single fix to any I’ve reported. The 40SB one (reported May 2009) was still there about 10 days ago. Here’s another story with more details. Based on the description of the curve and the location, I’d guess he hit this culvert, but there’s not enough info to tell for certain. Seems like the cause here wasn’t holes in the road, but a rider who just lost control and ran off the road and into an obstruction. Ok, I misunderstood what he hit. The initial story said “ran over a culvert” (which doesn’t make much sense in retrospect) and i translated it to “grate”. and, apparently its also not the same “Chartiers” I thought it was. Double fail. I did kind of wonder how f’d up a grate would have to be to throw a motorcycle – although I think some of the sunken ones could do it, especially where big gaps open up. The reason I posted about it was I thought someone getting killed on one of these things might actually spawn some action. 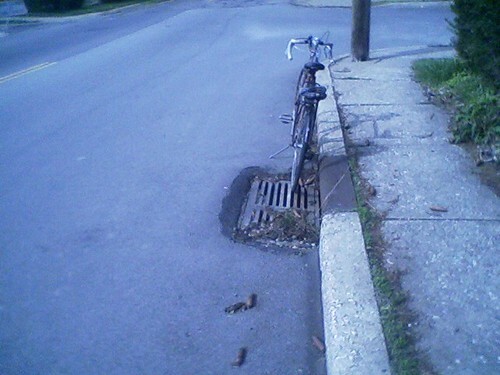 I could definitely see problems with a sunken grate for a motorcyclist. Big endo at high speed. So, yesterday I went and checked out the missing grate I reported to 311, it’s on Stanton right about where it turns into lake, just past the tennis courts. 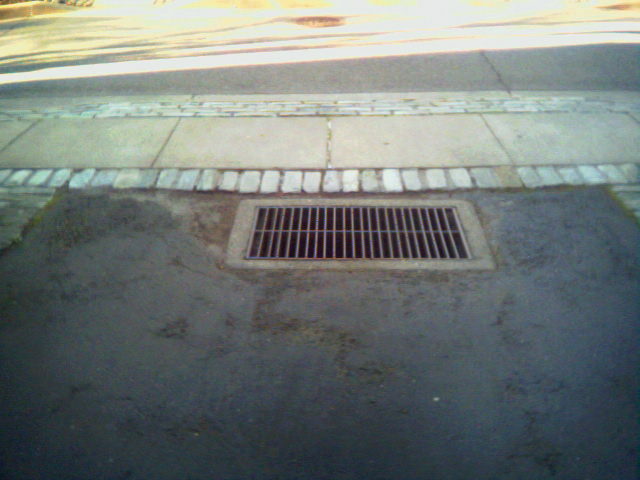 I was appalled at the “solution” – instead of replacing the grate they installed a metal plate. I am hoping this is temporary but I’m worried because it is weirdly cemented in place. 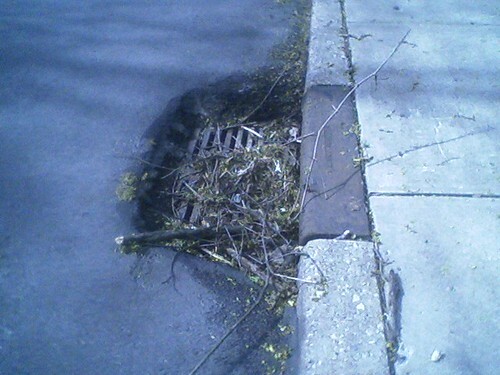 The problem is, it is not even remotely flush with the road surface. The saving grace is it is in the brick gutter so no one should be riding there, but it would not be a pleasant thing to hit. Well, it is better that the gaping hole that was there before I guess. Sorry, I didn’t take a picture. I grates in Hays that Vannevar mentioned (7months ago) have finally been replaced with safe ones! I think they were replaced sometime this week. It sure would be nice if we’d get progress on some others. *I* know to avoid the half dozen I regularly encounter (Babcock Blvd, 40SB, a couple of slightly shifted grates on Perry Hwy between Pines Plaza and CCAC North), but woe to anyone else. Some of these have been reported for going-on-three years. Thanks for the news, Andrew. This one is sure to warm the cockles of Swalfoort’s heart: I absolutely fell into this one this afternoon, unintentionally too. Sixth Avenue at that little alley that’s just downhill from the front door of the Regional Enterprise Tower. I was headed uphill on Sixth, then turned behind a stopped bus to head down the alley to get to my bus stop at Seventh Avenue, and my front wheel dropped right into it. Of course I came to a complete standstill. Fortunately I was hardly moving, and more fortunately traffic was stopped, but yes, these can be really annoying. Stu – I came off a curb by whole foods to get on the road and hit one of these too. 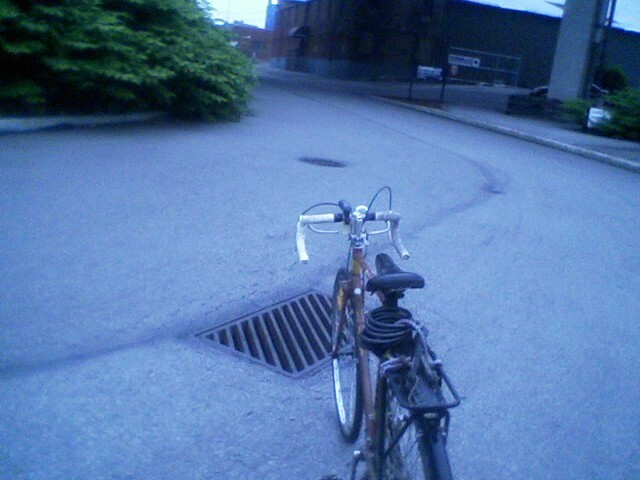 Sent me over the bars, pinch flatted my tire, put a nick in my front rim (which I was able to hammer flat). @ben; don’t know that City/County/State will be too concerned with a grate that is misaligned for cyclists coming off a curb (as in an unanticipated movement), especially if works for cyclists in the predominant flow of traffic. But, I’ll call the one into 311, and if Ben gets me the info on the one near Whole Foods, I’ll add it to the list. I had been ignoring these all along, as 99.9% of the time they aren’t a problem. I just didn’t expect to be that 0.1%, and RIGHT in front of where you work. 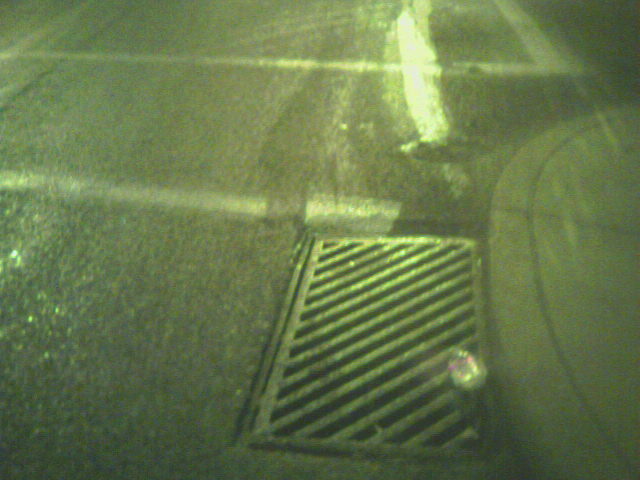 If the bus had been 15 feet back of where it was, I wouldn’t have tried to make it down Montour Way in the first place. 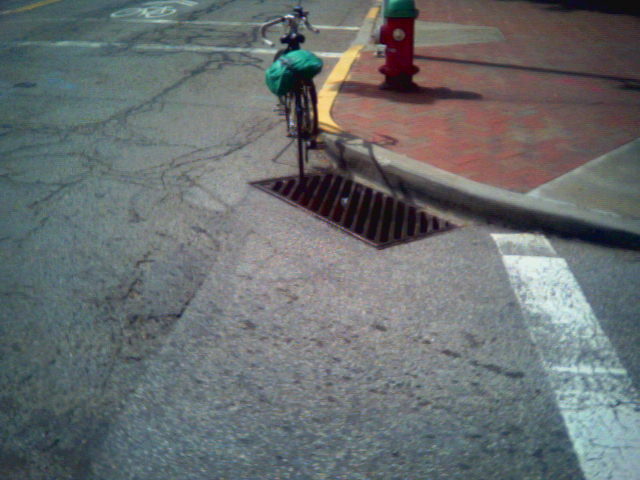 Had it been 15 feet farther down Sixth, I would have missed the grate entirely. 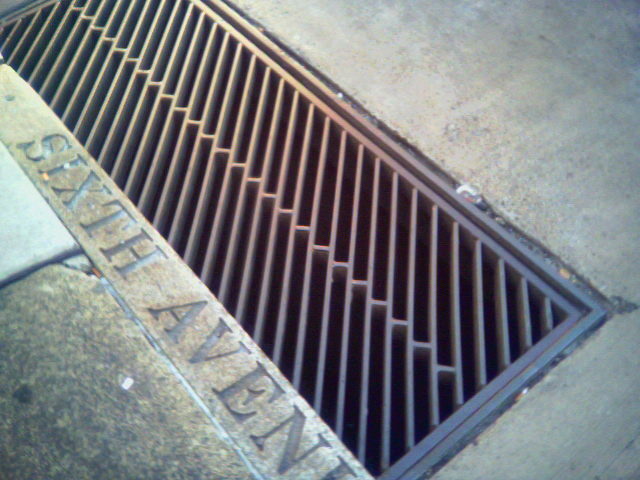 Short answer, they really need to start swapping out ALL the slotted drain grates, even this design. Meanwhile, I patiently await action on 40SB, Ingomar at Harmony, Babcock in Millvale by the Shop & Save, etc. … I know not to fall into them, but they’re out there waiting for some other unsuspecting cyclist. “Unanticipated movement”: That’s CarThink. No, cars would not drive off curbs or pull 180s in the middle of Sixth Avenue, but bikes do it all the time. I drive off the curb in front of City-County Building every time I leave there, since there are too many pedestrians at the corner to comfortably merge with traffic. The point to be made is that slotted drain grates can be a problem, even where it is not intuitively obvious that it is a problem. @benzo, please get a photo of yours, if you could? I found this doozy in a “bicycles need not apply” housing development on the South Side, Franklin Square, right off of South 17th Street. Probably private property, but literally a couple hundred yards from the SSide trail. This is right on the driveway going into the place. McKees Rocks has a few of these, too. This one is on Rox Way at Third Ave, which almost lines up with Russellwood. McKees Rocks is such a flat area (with the exception of one tall hill in the center), and the whole town is posted 25 or even 15, so I’m surprised they aren’t just crawling with bicycles. This might be part of why they aren’t. I don’t know how I never noticed this one before, for the dozens of times I’ve ridden past it. Perrysville Avenue at East Street, northbound, across from Perry Traditional Academy. It’s not the worst condition I’ve ever seen, but if you were making the hard right off of Perrysville onto East, and cutting it close to the curb, you could catch one of these outer slots. Iowa at Rampart, Hill District. I will have to admit that this one is fairly low priority, as it only takes you to a sidewalk that ends 40 feet later where the street ends. Still, you have to wonder, would anyone in the house whose driveway is adjacent ever use a bicycle? I can’t believe nobody’s reported this one before. I can’t believe nobody’s reported being hurt by this one before. Where Alexis Street hits the Panther Hollow Trail is a perfectly placed wheel eater right on the connection between street and trail. 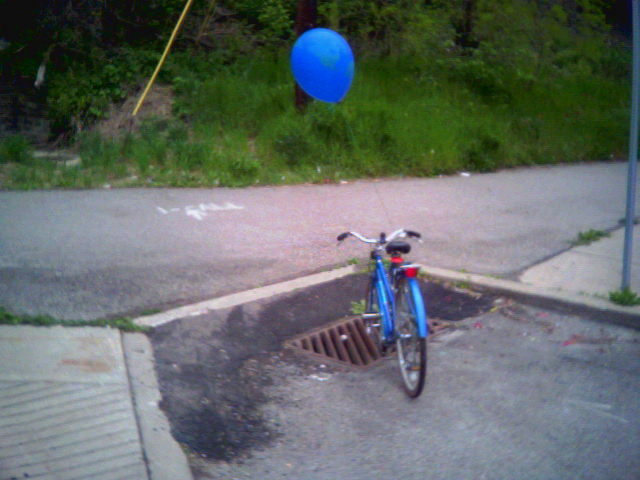 The blue balloon was from the Earth Day ride from Chatham U to Phipps Conservatory. 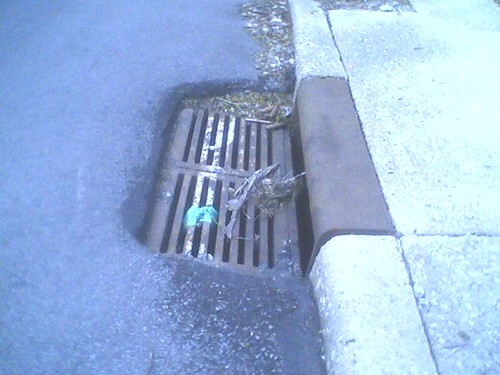 In addition, I saw a couple of real nasty holes alongside drain grates on outbound Fifth Avenue near WQED. One is just before the studio, one is just a bit after. Did not get pictures, but watch out! 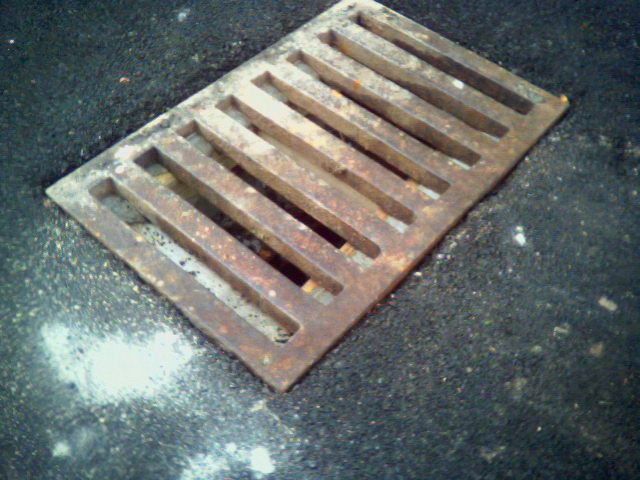 To clarify, I think the grates themselves are OK, but the road adjacent to them has degraded to being a serious hazard. Probably 311 material, but I don’t want to report it without an exact position, which I don’t have. Could someone else please do this? There’s a couple in the shoulder that run parallel to the road on Beatty Rd. in Monroeville between Rivertowne and the CCAC campus (otherwise nice road to ride on). Few things grind my gears more than to see one of these replaced when they could have done something about it. This one is in freshly repaved Columbia Avenue in West View. It’s on the uphill side of the street, so a law-abiding cyclist would hit this at fairly low speed. 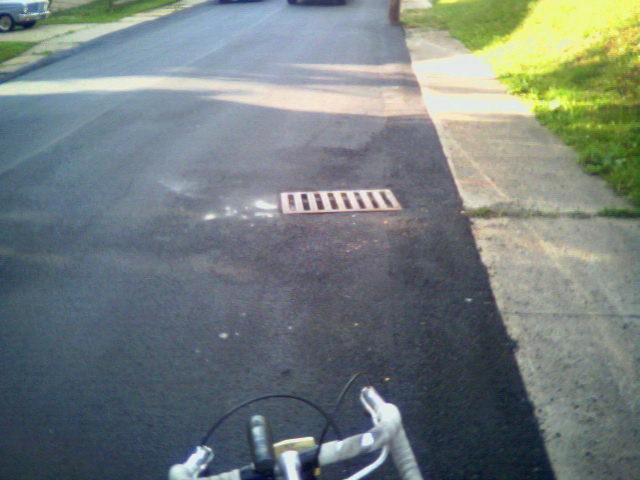 A stupid cyclist, OTOH, coming down the hill on the wrong side, would hit this at some speed. Look closely at the close-up photo. 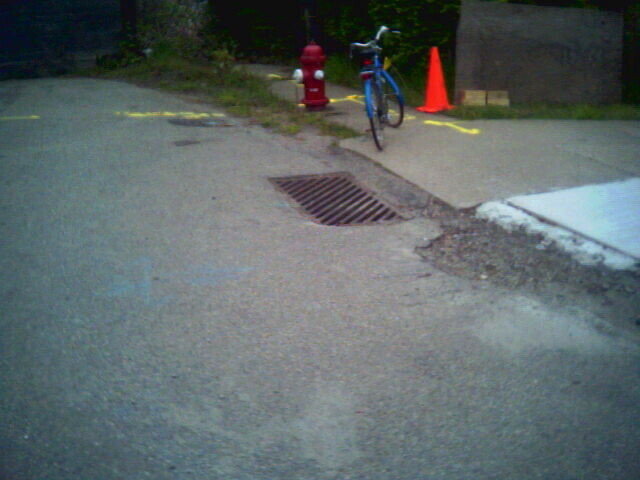 That is fresh sand just to the left, meaning they JUST put this in place (photo taken June 7 2012), and an even closer inspection shows a fresh 2×4 under the grate. 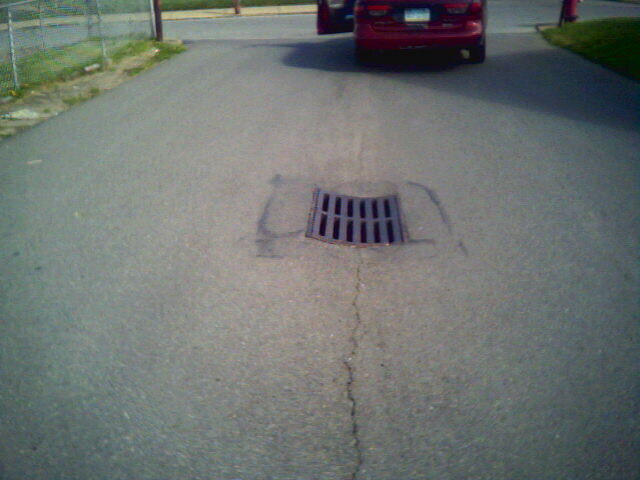 Why you would have a 2×4 in a drain grate in the first place, I don’t know; maybe it’s temporary? A glance at StreetView shows it isn’t new, it’s been there a while (image date Sept 2007), but it’s exactly in the wrong place, and needs to be replaced ASAP. Another one that I myself nearly fell into at low speed. 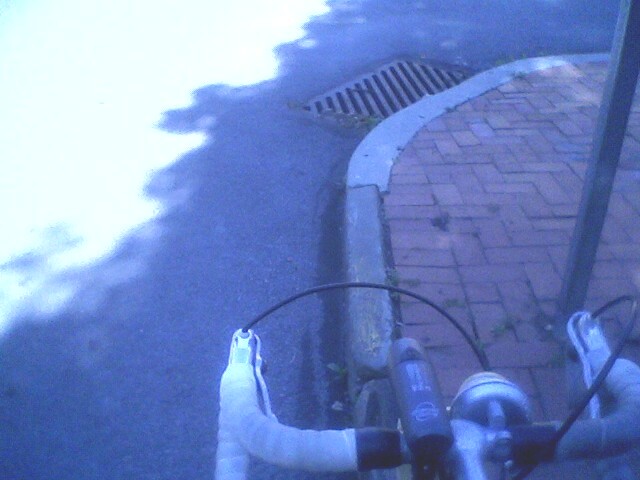 I had just taken the garden pic for the Wheelset thread (link), and was wobbling away across West Ohio at a near stall. 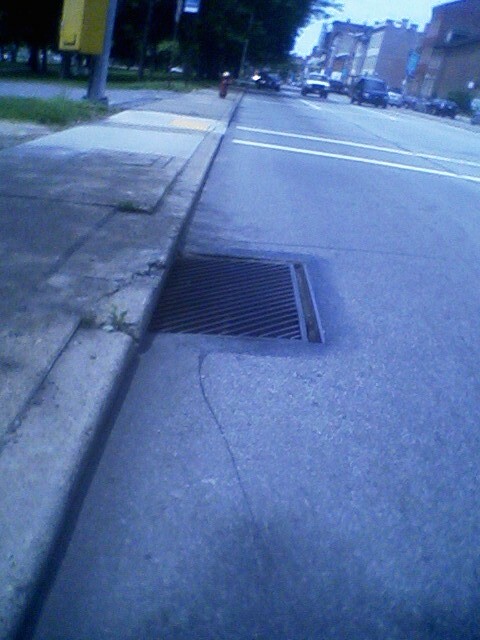 I crossed the grate with less than 30 degrees variance from the alignment of the slots as I tried to avoid the curb (originally aiming for the curb cut up to the sidewalk but wavered too far left). Follow-up to edmonds59: No, my son wasn’t near Frick or Allegheny Buildings the last couple of days, but he will be at the Anthrocon by the Convention Center for the next few. If he has a bike with him, it’s his old brown Huffy with the newly replaced 3-speed IGH and a yellow U-lock. There is a terrible one on Greenfield Avenue (not so much because of the grate itself, but because there’s a growing gap between it and the pavement) that I keep meaning to 311. I rode past it again today. I haven’t reported any of these yet, but this one here is wicked deadly and needs immediate attention, on West Carson Street outbound, 1600 block, right near the strange fuel station. Deteriorated pavement beside the grate, just the right size to eat a wheel, right where you need to be paying utmost attention to 2 lanes of speeding traffic. Didn’t they just redo this stretch of WCarson in 2009 or so? And the pavement is crumbling already?